(Newser) – US scientists have been keeping a worried eye on a fast-spreading fungus overseas that proves devastating to salamanders, and yesterday in Science they issued a plea to the federal government: Stop the imports of salamanders immediately. The stakes are about much more than pet store sales, explains LiveScience: North America is home to almost half of the world's salamander species, and the creatures play a big role in local ecosystems. Among other things, they gobble up insects and are themselves a food source for larger predators. "This is the hot bed in the world for diversity of amphibians, and if that fungus gets here, it's going to be devastating," says study author Vance Vredenburg of San Francisco State University. In Karel Capek's War with the Newts (1936), the Newts counter Christian attempts at conversion by turning to a god of their own creation named Moloch: At a later period and almost universally the Newts themselves came to accept a different faith, whose origin among them is unknown; this involved adoration of Moloch, whom they visualized as a giant Newt with a human head; they were reported to have enormous submarine idols made of cast iron, manufactured to their orders by Armstrong or Krupp, but no further details ever leaked out of their cultic rituals since they were conducted under water; they were, however, believed to be exceptionally cruel and secret. It would seem that this faith gained ground rapidly because the name Moloch reminded them of the zoological "molche" or the German "Molch," the terms for Newt. 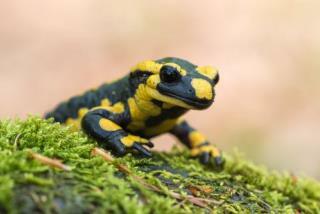 Salamanders can be attacked by this fungus? Any chance the fungus might eliminate liberals? I newt was going to come to this!